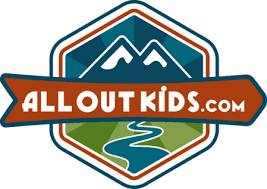 If you've been following this website and my previous posts, you'll know that I LOVE skiing. I've expressed a mild interest in snowshoeing but only as an absolute, there is no way to do this trail on skis, kind of sport. I've actually laughed at people slogging up (and down) trails on snowshoes in the past, wondering why on earth they would choose this slow and arduous method of travel over the often effortless gliding down hills that can be done on skis. 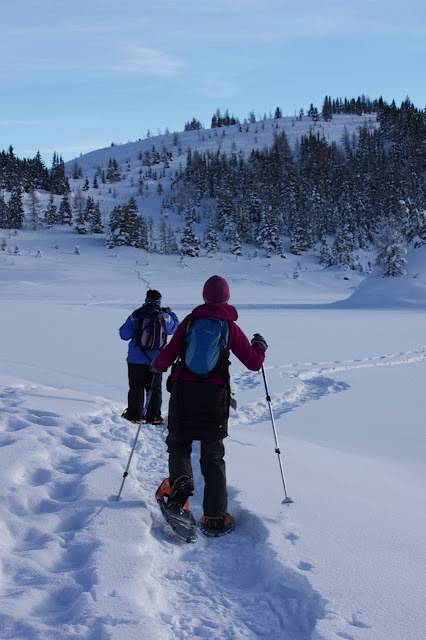 Well, now it's time to eat my previous words and say that Snowshoeing is AWESOME! I love this sport and there's nothing arduous about it when you choose to go out with White Mountain Adventures for the day. 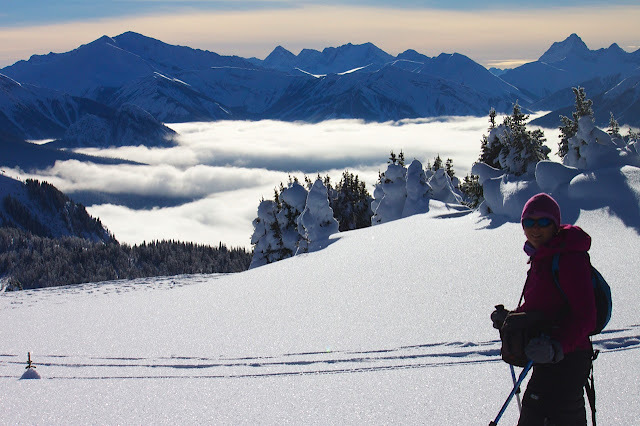 Last weekend I rounded up three awesome girls for a trip up to Sunshine Village Ski Resort for an afternoon guided snowshoe tour with local Banff company,White Mountain Adventures. I'd been following their adventures on Facebook for a while now and was blown away by the amazing winter scenery above Sunshine Village. I've been up to the Village in summer and autumn several times to hike around Sunshine Meadows but I'd never had the opportunity to visit this incredible place in winter before. There are two ways to access Sunshine Meadows in Summer and one involves a long boring walk up the ski-out which takes about two hours of walking up the 5km paved road. The other way is much more pleasant and involves a shuttle bus ride up to Sunshine Village. White Mountain Adventures runs buses from the parking lot of the ski hill up to the top village, accessed by gondola in winter. Meanwhile in winter, you have several options for accessing the backcountry paradise of Sunshine Meadows. 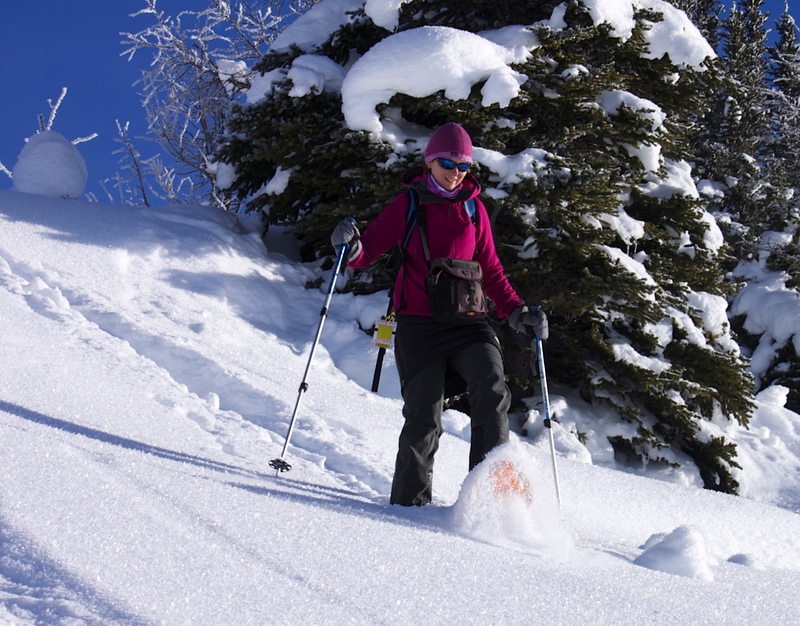 Again, you can ski or snowshoe up the ski-out (and risk getting knocked out by the downhill traffic on this popular descent route from the Village) or you can ski up Healy Creek, over Simpson Pass, and down to Sunshine Meadows. Three words for that one - Very Long Day!!! (and you'd definitely need skis.) A more pleasant way to access the meadows is to take the same gondola that ferries skiers up to the Village. From there, you'd be on your own to navigate the ski runs, again trying to avoid being knocked out by a beginner out of control on the Strawberry run, and you'd have to pray for good weather. White-out conditions would make finding Rock Isle Lake at the heart of Sunshine Meadows a bit challenging to say the least! Finally, there is the sweetest option yet - and the only option in my mind for a safe, reliable, and FUN tour of Sunshine Meadows and the winter wonderland that lies outside the boundaries of the Sunshine Village Resort. Enter, White Mountain Adventures to make it happen! We met our tour guide in Banff at the Mount Royal Hotel for a short 15 km shuttle bus ride up to the ski hill. Not only did we get priority parking in front of the resort, but we actually got a parking spot! If you've tried to find parking at Sunshine Village on a weekend, you know that you have to be there by 9am. We were blessed to have Gordon Stermann, President of White Mountain Adventures, as our guide extraordinaire of the day. He was full of knowledge, stories, and history on the area and the company's tours. We were each given a pair of snowshoes before boarding the gondola for a stunning ride up to the Village. Once at the village, we made our way over to the Standish Chair Lift for another scenic ride high up above the resort. From the top of the Standish Chair it felt like we were on top of the world and we could look down on Sunshine Meadows, Rock Isle Lake, and the Continental Divide spread out in front of us. The best part about looking down on Sunshine Meadows from the top of the Standish Chair was knowing our destination was below us rather than above us. All we had to do to reach our destination was walk downhill through soft fluffy snow! It doesn't get much sweeter than that. Little effort required! It's definitely a novice-friendly tour and something that can be done by anybody in average to moderate health. We glided and floated our way down to Paradise Valley through some of the most stunning scenery I've ever seen. Far away from the ski resort, we were able to witness a valley that few ever see in the winter. I had just as much fun as I've ever had on skis as I ran down hills sliding in the soft snow with each step. The highlight of the trip was having hot chocolate and cookies on the small island in the middle of Rock Isle Lake. I've looked out at the island many a time in recent trips and never dreamed I'd get to stand on it or walk across the lake to reach it. Upon leaving Rock Isle Lake, we climbed gradually and slowly following a gentle pace set by our guide until we reached a sign marking the Continental Divide. Apparently we had been hiking in British Columbia for a portion of our day which I thought was pretty cool. It didn't take more than 20 minutes or so and the brief up-hill portion of our trip was behind us, and all that remained was a short easy walk on mostly groomed terrain back to the Village. Gordon chose the safest method possible to get us through the resort ski area, and tried to keep us in the trees slightly above where skiers and boarders would be flying past us. We all appreciated this attention to safety and precaution. We arrived back at the village euphoric from such a beautiful trip, an empowering experience, and a fresh new sport under our belts for 2013. We rode the gondola and shuttle back to Banff, grabbed coffees to go, and I proceeded to chatter non-stop all the way back to Calgary. (Things excitement will make you do.) When we got home I was still bouncing and didn't stop moving until I eventually crashed on my bed and realized I was really, really tired! The next morning arrived way too early and I realized as I got out of bed that somehow amidst all the playing, I'd actually gotten an amazing work-out too! I hadn't realized that each giant lift of the legs through the powder would do so much for my muscles! 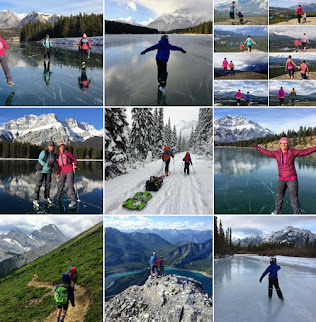 Way to go snowshoeing - A sport that's fun, that you can do with your friends, AND that gives you an amazing work-out you'll feel the next day! I can't express my gratitude enough to White Mountain Adventures for their support and assistance in this tour. I'm definitely recommending the tour and their guiding services to everybody looking for a classic Canadian experience this winter! 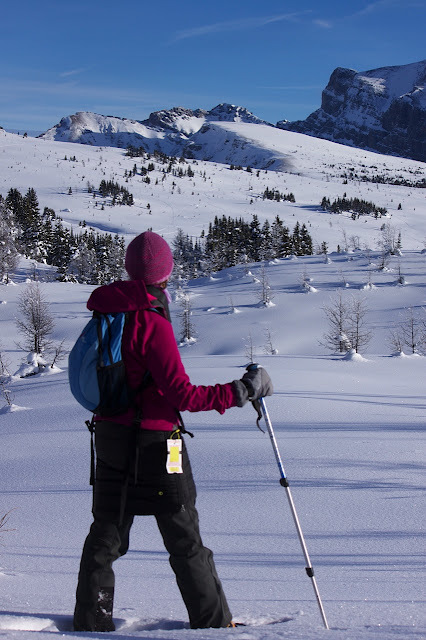 To book your own winter tour with White Mountain Adventures, check out their website here. It's 2013 - time to try something new. 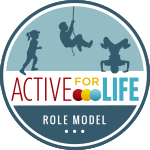 What sport do you want to try this year? 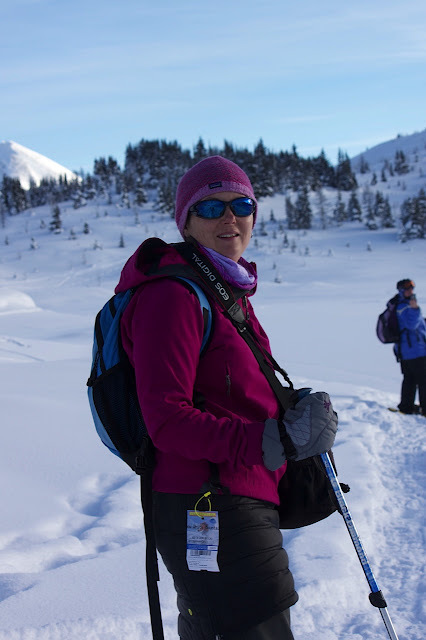 Disclaimer: White Mountain Adventures sponsored my participation in this snowshoe tour. As always opinions and endorsements are entirely my own. 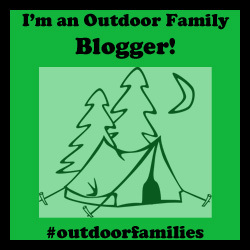 Thank you for this great blog post! It brought me back to when I did this trip with White Mountain Adventures as seen in my blog post. http://alexmac2008.blogspot.ca/2010/12/snowshoe-on-top-of-world.html I have been snowshoeing for many years and absolutely love it. Glad you have discovered the enjoyment in it! Thanks Alexandra. I'll check out your post on Sunshine Meadows. Thanks Amelia. Do you have a down skirt? They're super fun. And yes, you have to come up here. We may be down your way too this summer. Trying to plan out our summer vacation. Waiting to see if we can get a trailer first to make a 2 week camping road trip a bit easier. Where do you get the down skirt? Looking for one to buy or material to make one! I love it. I ordered it from Alaska.